The CHANCE® Soil Screw® Retention Wall System reinforces the earth to construct gravity walls. 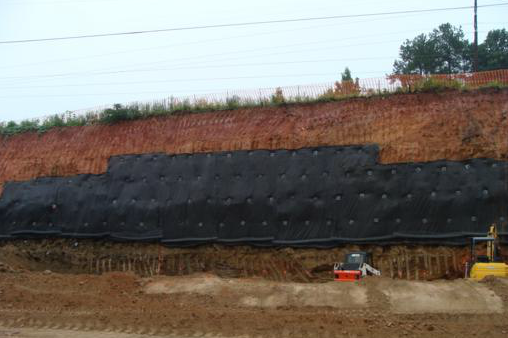 The CHANCE® Soil Screw® Retention Wall System reinforces the earth to construct gravity walls. Its speed and bearing mode make this option a cost-effective and time-efficient alternative to tradition methods of soil nailing. In this “soil nail” application, the CHANCE® soil screw acts in a bearing mode, instead of a grouted anchor, that relies on friction. The soil screw® system removes performance uncertainties and costs associated with grouted soil nails in low shear strength soils. Common equipment such as Mini-Excavators and skid-steer loaders can quickly rotate the soil screws into place. Anchor size and grid spacing are designed to local soil conditions and load requirements.